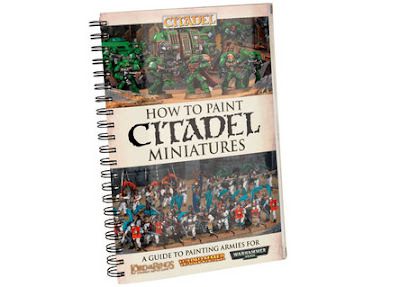 I've been meaning to put together a post about the new Citadel How to Paint guide for a while now, so here it is... before I go too much further I want to stress that all imagery contained in this post was originated by and remains the property of Games Workshop. The new painting guide was released several months back alongside the new range of paints (logical...) and, to be fair, I was pretty sceptical at first, given the price tag and the fact that it's predecessor was a little uninspiring. Whilst it did have variation in the techniques and approaches demonstrated within, the quality of the figures on the front cover was not replicated within the pages of the book. A bit of a let down. However, the new version is in a different league. Having only read the first couple of pages of the copy I borrowed from Dan over at Hobby Before I Die, I was browsing the net looking for the best price on a copy for myself. Straight away, you notice that this version has been well-considered. The format and binding, along with the thicker-card expandable backing, means that you can stand the book up at your work space, so you can easily reference the guide as you work, without having to hold it open with your elbow or weigh the pages down with other things. The feel of the examples is definitely more accessible, and whilst I don't consider myself a complete novice, it's nice to go back to basics and take a different look at things. 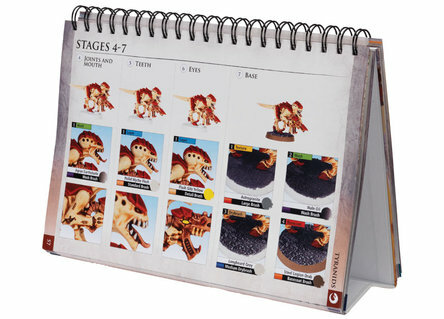 You'll also note that the style within the book is consistent with the painting guides that are currently appearing in White Dwarf, so great consistency there too. Furthermore, you also get a DVD bundled with the book and again, although I don't see myself as a total beginner, it's good to see the examples in the book actually being demonstrated. Some of the content is really basic, but it's great that newbies to the hobby are being catered for. I found that starting out collecting and painting at the tail-end of the '90s (jeees I feel old...) was a bit of a struggle and asking for advice in GW stores always came with a knowing look of "duh, don't you know!" Liking the demo on the Marauder, although I'm not sure I'd apply the lightest layer (Kislev Flesh)... that being said, I've picked up a pot to try it out. The base colour is Bugmans Glow and working up through Cadian Fleshtone. I've also picked up some of the demo colours that are used on the robes in the Dark Angels example as I'm anticipating painting some of the DA models I recovered from the attic a couple of months back. Anyways, to summarise; well worth a look. The recent development with paints (foundations and washes, through to the latest releases) have really helped improve my painting, but I'm inspired to try a new approach to some subjects after reading the new painting guide. I'd definitely recommend it to hobby newcomers or those who are uncertain about their painting techniques.